Satellite images provided by NOAA / NASA / MODIS. Hurricane tracks courtesy of the National Hurricane Center. 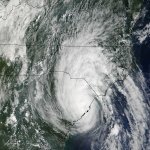 Hurricane Alex developed off of the coast of South Carolina, then moved northeast brushing the Outer Banks of North Carolina as a category 1 hurricane. 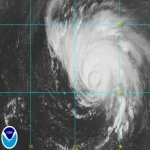 It strengthened into a category 3 hurricane well east of the Maryland and Deleware coast. It became a cat 3 farther north tahn any other hurricane except for Hurricane Ellen in 1973. Hatteras Village measured a gust to 105 mph. Hurricane Charley struck southwestern Florida as a category 4 hurricane. It started as a tropical depression near the Windward Islands. From there it moved northwest across the Caribbean Sea moving just south of Jamaica and across The Cayman Islands before striking western Cuba. It rapidly deepened in the southeast Gulf of Mexico and made its next landfall near Punta Gorda, Florida. After crossing the peninsula of Florida, it reemerged into the Atlantic moving northeast and making its final landfall near Cape Romain, and North Myrtle Beach, SC. Strong winds battered western Cuba with a gust to 150 mph at Playa Baracoa. 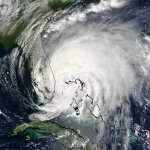 In southwest Florida, winds gusted to 173 mph at the Charlotte County Medical Center and 160 at the country airport. Several tornadoes were reported with Hurricane Charley. Of the nine in Florida, the south Daytona Beach tornado was the strongest with a 1/4 mile long track. Hurricane Danielle developed southwest of the Cape Verde Islands and moved generally north through the north central Atlantic Ocean. It reached category 2 status and did not threaten any land mass or cause damage. Frances formed off of the coast of Africa and continued west-northwestward over the tropical waters of the North Atlantic Ocean. It turned more northwest before reaching the Lesser Antillies. It resumed a more west-northwesterly course and stayed north of the Islands. 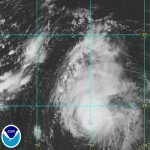 It strengthened into a category 4 hurricane east of the Turks and Caicos. From there, is battered the eastern Bahamas with San Salvador reporting a wind gust to 120 mph. 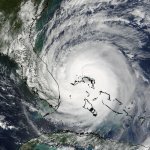 Hurricane Frances then made landfall on Hutchinson Island, FL as a category 2 hurricane with Ft. Pierce clocking a gust to 108 mph. A storm tide of 3-7 feet was observed on the Florida east coast with the highest at Fernandina Beach with 7.73 feet. Heavy rain was also recorded with Gainesville and Ocala both measuring 10.81". Frances produced 103 tornadoes, only behind Hurricane Ivan - 123 tornadoes and Hurrican Buelah - 115 tornadoes. Hurricane Gaston briefly strengthened to a category 1 hurricane just before landfall near Awendaw, SC. Gaston will be remembered for the flooding rains it brought to the Carolinas and Virginia. Kingstree, SC reported 10.50" of rain, Mechanicsville, VA 10.70", Richmond Math and Science Center 12.30", and Richmond west end 12.60". Eight people lost their lives due to the flooding rains in Richmond. Hurricane Ivan was a category 5 hurricane that developed well south into the tropics. It carved a path through the southern Windward Islands. Tobago, St. Vincent and the Grenadines, Barbados and Grenada suffered damage. Grenada by far, sustained the most damage with 80% of the island losing power and 80% of the nutmeg trees destroyed. 14,000 homes were damaged or destroyed. A gust to 116 mph was clocked at Port Salines. Hurricane Ivan was the worst hurricane to affect Grenada since Hurricane Janet in 1955. From there, Hurricane Ivan moved northwest just south of Jamaica and Grand Cayman. Jamaica had sustained winds of 134 mph at Pedro Bank. The island had 47,000 homes that were damaged. On Grand Cayman, 95% of the homes were damaged. Winds gusted to 172 mph. An 8-10' storm surge affected Grand Cayman with 20-30 foot waves. The island was under 5-8 feet of sea water! Hurricane Ivan then made a pathway through the Yucatan Channel northward to make landfall at Pine Beach, AL. 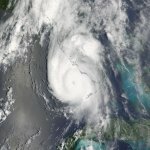 Ivan moved inland and made a wild loop off of the Atlantic coast, moved across south Florida and became a tropical storm again in the central Gulf. It weakened and made its final landfall as as tropical depression on the southwest coast of Louisiana. Northwest Florida sustained severe damage and a storm surge of 10-15 feet in Escambia and Santa Rosa counties. 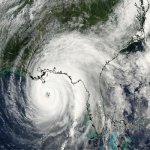 Hurricane Ivan also spawned 123 tornadoes in the eastern U.S..
Hurricane Jeanne made landfall at Hutchinson Island, Florida, in esentially the exact same place as Hurricane Frances about three weeks before. Jeanne formed over the Leeward Islands and moved off of the coast of the Dominican Republic heading northward. Jeanne looped and started west toward Florida where it became a category 3 hurricane before landfall. The strongest wind gust was reported at Ft. Pierce at 87 mph. The storm tide was comparable to Frances's with 6-10 feet common from the north Florida coast northward to Charleston, SC. Jeanne caused a great loss of life in Haiti. About 3000 people lost their lives as a result of flooding and mudslides. 200,000 were reported homeless after the floods. Rainfall totals ranged from 15-25 inches across Puerto Rico. Hurricane Karl was born is the tropics and generally moved north through the North Atlantic. It caused no damage even through it was a category four hurricane. Top sustained winds were estimated at 145 mph. Hurricane Lisa followed a very similar path that Hurricane Karl took. Lisa had a tough time developing with Karl and a tropical wave on both sides of it. 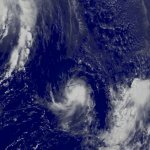 Lisa became a minimal hurricane at 75 mph before becoming extrtropical in the northern North Atlantic Ocean. 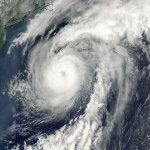 Hurricane pictures and summaries main page.